While working on HBase bug fixes and feature development, it’s often quite convenient to test changes on a local-mode HBase. This is done by running HBase right out of your developer sandbox. Though a lot of HBase development happens on Macs these days, it’s a system designed first to run on Linux. That means there are a couple minor annoyances for non-Linux users. Let me show you how I work around one of them. Between HBaseCon and Hadoop Summit I took a short trip to Europe. I got to spend some more time working along side Nicolas and meet some of the Scaled Risk crew. I also took a small holiday through the hillside in Romania! Along the way, I was invited to present for both the Paris HPC Meetup and the London HBase Meetup. Every year at Hadoop Summit there’s a little un-conference, call the Birds of a Feather Sessions, or BoF for short. 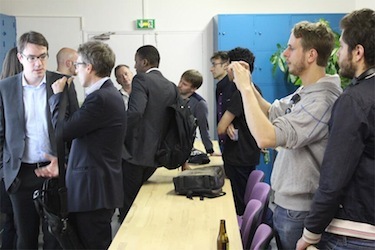 These are topical meetups that take place after the conference proceedings and are open to non-attendees. This year I helped organize the HBase BoF, along with Subash D’Souza. The Latency Talk Nicolas and I gave at HBaseCon has been accepted for Hadoop Summit San Jose. If you missed us at HBaseCon, you get one more opportunity! We’re speaking on June 4th at 3:25p. Edit: Unfortunately, Nicolas was unable to make it so I presented solo. I hope I did his section justice. 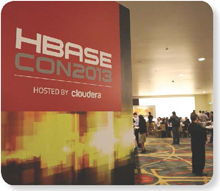 HBaseCon was another fantastic conference this year! It’s a great resource for information about and around HBase, no matter where you are along your path. This year I presented a talk along with a colleague of mine, Nicolas Liochon of Scaled Risk fame. Our topic: HBase as an online, low-latency system. Edit: The sequel post, BlockCache Showdown is now available! HBase is a distributed database built around the core concepts of an ordered write log and a log-structured merge tree. As with any database, optimized I/O is a critical concern to HBase. When possible, the priority is to not perform any I/O at all. This means that memory utilization and caching structures are of utmost importance. To this end, HBase maintains two cache structures: the “memory store” and the “block cache”. Memory store, implemented as the MemStore, accumulates data edits as they’re received, buffering them in memory 1. The block cache, an implementation of the BlockCache interface, keeps data blocks resident in memory after they’re read. This is the first of two posts examining the use of Hive for interaction with HBase tables. The second post is now available. One of the things I’m frequently asked about is how to use HBase from Apache Hive. Not just how to do it, but what works, how well it works, and how to make good use of it. I’ve done a bit of research in this area, so hopefully this will be useful to someone besides myself. This is a topic that we did not get to cover in HBase in Action, perhaps these notes will become the basis for the 2nd edition ;) These notes are applicable to Hive 0.11.x used in conjunction with HBase 0.94.x. They should be largely applicable to 0.12.x + 0.96.x, though I haven’t tested everything yet. I spent last week in NYC at this year’s Strata+Hadoop World, where I was invited to speak. The title of this talk is the same as the talk I gave at the Big Data Deep Dive in May, but the content received a thorough overhaul. Thanks to all the attendees and friends who give me great advice on this first go-around. Hopefully the improvements were helpful.